Visitors to York in the summer of 2018 will be able to experience Shakespeare's plays in much the same way that the Bard's original audiences did more than 400 years ago. And they won't have to make a lengthy side trip to Stratford-upon-Avon or Shakespeare's Globe Theatre in London to do it. 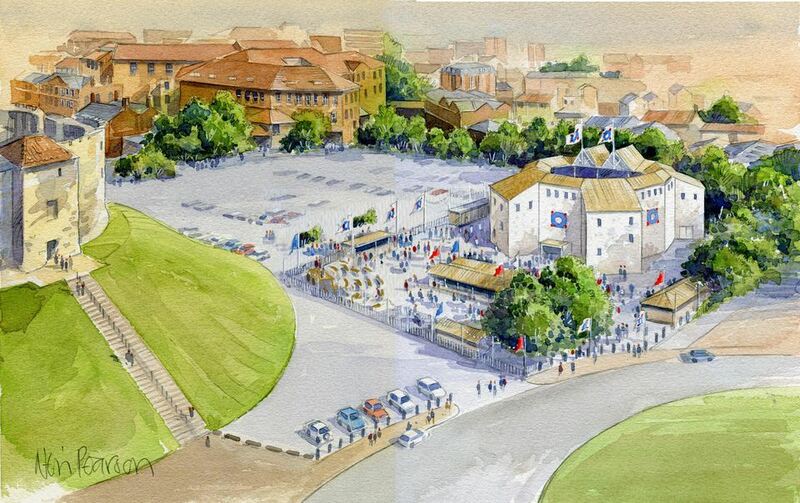 Shakespeare's Rose Theatre, being proclaimed by its organizers as Europe's "first pop-up Shakespearean theatre," will offer the public a sort of hybrid experience—part high-tech scaffolding and part Elizabethan, open-air theater. The Rose, set to open in June 2018, will combine state of the art scaffolding, corrugated iron, and timber in a 13-sided playhouse capable of housing 950. A total of 600 will sit on three tiered balconies around an open-roofed courtyard and another 350 will be able to stand and mill about, right up to the edge of the stage in the "pit" (probably exchanging banter with the performers as the "groundlings" did in Shakespeare's day). The theater was inspired by the London Rose Theatre, a Tudor theater build 12 years before Shakespeare's Globe Theatre and located just a few hundred meters away. It's being built in the open area, just below the remains of York Castle, known as Clifford's Tower, a site with a dramatic and haunted history of its own. Adding to the immersive Tudor experience, "Shakespeare's Village", surrounding the theater and free for all, will feature Elizabethan entertainments—jugglers, musicians, jesters, and free "wagon" performances. Food and drink, highlighting the best of Yorkshire products, will be served in oak-framed, reed-thatched buildings, and an Elizabethan garden is being created with ornate beds for vegetables, flowers and herbs. The theater is a project from Lunch Theatrical Productions, an international company behind touring productions of Broadway and West End Musicals as well as special events, dance and ice show spectaculars in Europe, Australia, and more. Macbeth and A Midsummer Night's Dream, both directed by Damian Cruden, artistic director of York Theatre Royal for the past 20 years. Cruden won an Olivier Award (London's equivalent of New York's Tony Awards) for his groundbreaking production of The Railway Children, incorporating a real vintage steam engine, at the National Railway Museum in York and later Waterloo Station and Kings Cross Theatre in London. He was also behind the highly regarded York Mystery Plays in 2012. Romeo and Juliet and Richard III. A winner of two Olivier Awards for his production of Death and the Maiden at the Royal Court, Lindsay Posner was nominated for four, including Best Director, for his production of Arthur Miller's A View from the Bridge at the Duke of York's Theatre in London. He has worked with the Royal Shakespeare Company on Twelfth Night and the Taming of the Shrew. Tickets range in price from 12.50 pounds for groundlings in the pit up to 59.95 pounds for Premium seats. York Experience tickets, at 90 pounds per person, including backstage visits and hospitality, are available for corporate entertaining and private parties. Group discounts, reduced price tickets for children under 17, and special schools performances are available. Wheelchair spaces include free carer seats. As of December 2017, tickets for the 2018 summer season are being sold through Ticketmaster or the York Theatre Royal box office. Find out more about how to book tickets here. Following the launch season, the theater will be dismantled and then re-erected for the summer season of 2019.